Alice Beside the Sea offers self-contained apartments: Studio, Two bedroom or the Four bedroom upstairs Holiday-House with ocean views, right on the beach and only one kilometre from the Spirit of Tasmania ferry terminal. Each spacious apartment has a fully equipped kitchen, undercover carport, balconies and garden. Enjoy views across Bass Strait, the beach and the river. 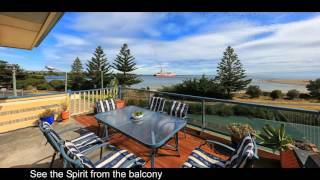 Watch as the Spirit of Tasmania ferry arrives and departs the island and enjoy a glass of wine on the balcony. Take a stroll along the walking track on your doorstep which hugs the foreshore and parkland. Alice Beside the Sea is close to nearby restaurants, cafes, bakery, supermarket and the local shopping hub. The accommodation is an ideal base to explore the many attractions of northern Tasmania including Cradle Mountain – Lake St. Clair National Park, local wineries, markets and penguin viewing. Head to Latrobe to taste fine chocolate at the House of Anvers chocolate factory or head to Elizabeth Town and sample delicious Ashgrove Cheese. Alice Beside the Sea is located in East Devonport and approximately a one-hour drive from Launceston. Prices indicated are from: depending on time of year, extra guests are extra price. Four bedroom upstairs holiday house, overlooking ocean and beach, with a large deck and barbecue. Sleeps ten guests in three queen bedrooms and the fourth bedroom has four (bunk) beds. This apartment features a spa bath. Large Studio apartment with full kitchen facilities, ensuite, queen bed, 50 inch plasma television, DVD player and movies. Lounge suite with rocker recliner, private enclosed patio with outdoor furniture and barbecue, opens onto large lawn and gardens, quiet and peaceful, take a stroll across the quiet road to explore the beach parkland and walking track, less than one kilometre from the Spirit of Tasmania Terminal. Self-contained apartment with queen bed and two single beds in the second bedroom. Please note bathroom is accessed via main bedroom. 60 inch plasma television, DVD player and movies, open plan kitchen and lounge. 2nd 48" TV and DVD player in main bedroom.